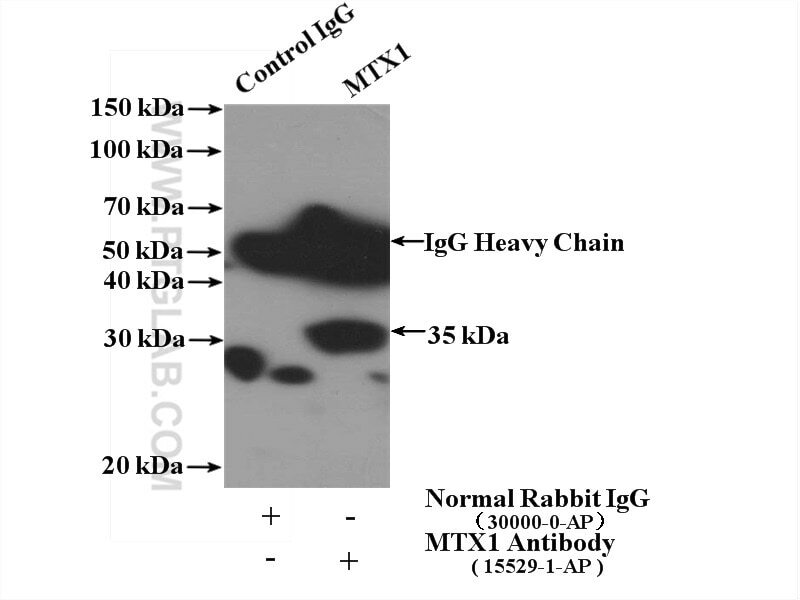 IP Result of anti-MTX1 (IP:15529-1-AP, 4ug; Detection:15529-1-AP 1:700) with MCF-7 cells lysate 1280ug. METAXINs are proteins located in the outer membrane of the mammalian mitochondrion. METAXIN 1 was characterized firstly and was found to play a role in the import of mitochondrial precursor proteins. It may also play a role in the assembly of b-barrel proteins into the outer membrane METAXIN1 was reported to be essential for survival of the postimplantation mouse embryo. METAXIN 1 has multiple transcripts. Several isoforms of METAXIN 1 exist due to the alternative splicing, with the predicted MW of 51, 48 and 36 kDa, respectively. Metaxin 1 interacts with metaxin 2, a novel related protein associated with the mammalian mitochondrial outer membrane and form complex in the mitochondrion outer membrane.